25 (NR). West Virginia (3-0) – They survived a test at home by a desperate BYU squad. Their offense is great, but this is not a vintage WV defense. 24 (NR). Tennessee (4-0) – The Vols came storming back at home to beat their rival Florida. It was a terrible football game, but the Vols improved to the most unimpressive 4-0 of any team. 22 (NR). TCU (3-1) – Their only loss to Arkansas is looking ok, even though they had that game won before choking it away by poor clock management. They are going to be a tough out in the Big 12. 21 (NR). Miami (3-0) – I am not buying in completely, but there are just not enough deserving teams to fill out a top 25. 20 (NR). Mississippi (2-2) – The Rebels showed their merit by annihilating Georgia. The loss to Florida State still stings, but they showed something putting up 40+ points on Alabama. 19 (NR). Western Michigan (4-0) – They have two wins over the Big Ten, and they just took out the best team in the Sun Belt. They are going to sneak up on national rankings as the weeks tick toward December. 18 (9). 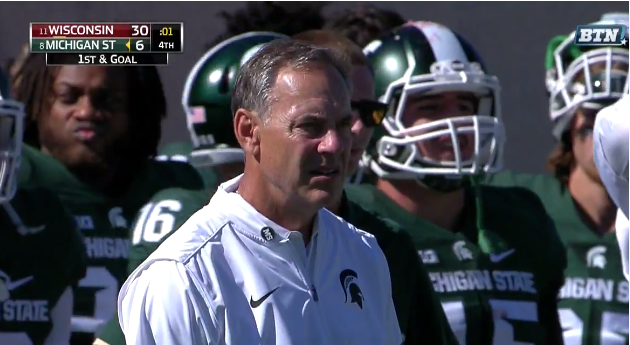 Michigan State (2-1) – Their win over Notre Dame looks less impressive, and they got rolled by Wisconsin. They need a new option at QB if they want to compete in the Big Ten East. 16 (21). Florida State (3-1) – The Noles looked like a different team playing a tricky road game at South Florida. They romped the Bulls almost as bad as they got romped the previous week at Louisville. 15 (18). Nebraska (4-0) – The Huskers won a road game against their budding rival Northwestern in an ugly game filled with mistakes on both sides. 13 (14). Boise State (3-0) – Boise won in Corvallis, which isn’t really a difficult test, but it is their second win over a Pac-12 team this season. 12 (15). Utah (4-0) – The Utes looked shaky against USC, but they have a winning mentality that is going to be tough to shake. They are the best team in the Pac-12 South. 11 (11). Baylor (4-0) – The Bears faced their first good team of the year in Oklahoma State, and the team looks like the best team in the conference after a decisive win. 10 (10). Clemson (4-0) – The definition of a trap game was Clemson heading to GT, where they have struggled over the years. They passed the test by dominating the first half. 9 (7). Stanford (3-0) – Stanford struggled for 3 quarters against an average UCLA before taking over. 8 (6). Washington (4-0) – The first real opponent that the Huskies have played turned into an overtime nail-biter. Arizona typically wins those games, but UW survives to take on Stanford on Friday night under the lights. 7 (8). Texas A&M (4-0) – The Aggies are a scary team right now. Trevor Knight appears to be the best fit for the Sumlin system that he has ever had. 6 (5). Houston (4-0) – The Cougars won by one of the most lopsided scores of the year. It was Texas State, though. Their strength of schedule is going to cause them to keep falling until they play Louisville. 5 (12). Wisconsin (4-0) – The Badgers looked like a different team than the one that struggled with Georgia State a week ago. Hornibrook is definitely a better option at QB than Houston. 2 (4). Michigan (4-0) – Penn State was a trendy pick to give Michigan a fight, the Wolverines ended the game early and look every bit of a national title contender. 1 (1). 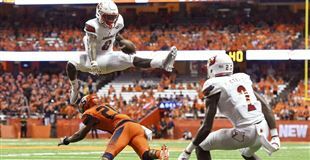 Louisville (4-0) – The Cardinals did nothing to lose their spot at the top of the rankings after destroying Marshall on the road. 5. Western Michigan (#19) at Central Michigan, 4:00PM CBSSN – The battle of the two best directional schools will likely be a shootout. Both are good teams, even though CMU had an embarrassing loss to Virginia on Saturday. 4. Kansas State at West Virginia (#25), 12:30PM ESPNU – This is not the sexiest matchup, but Kansas State is a tough team taking on an unbeaten team in the conference. It is an intriguing game nonetheless. 3. Wisconsin (#5) at Michigan (#2), 12:30PM TBD – Wisconsin is highly ranked because they do have two top 10 wins, but neither of them are really as impressive anymore. I don’t think they have much of a chance in Ann Arbor, but I’ll be watching. 2. Stanford (#9) at Washington (#8), FRI 6:00PM ESPN – This has become a mini rivalry over the years, but this is the most consequential game between them in decades. It will likely be a defensive struggle. I don’t usually like these types of matchups during the week, but I’ll take it. 1. Louisville (#1) at Clemson (#10), 5:00PM ABC – Can Louisville win a big road game? Can DeShaun Watson perform like the preseason Heisman favorite he was supposed to be? I can’t wait for this game. 5. Seth Russell, QB, Baylor – His stats are going to continue to impress all year long. If healthy, he will be invited to NY. 4. JT Barrett, QB, Ohio State – He is the technician and only veteran on the most surprising offense in the nation. 3. Jabrill Peppers, LB/CB/S, Michigan – He is being groomed to be Charles Woodson, and he is having just as good of a season as the former Heisman winner did. 1. Lamar Jackson, QB, Louisville – He is the most dynamic player in the nation by a mile. 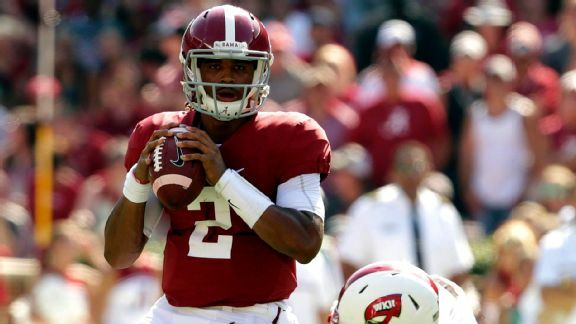 His rise to Heisman frontrunner can only be compared to Geno Smith. That didn’t end well, but I would be lying if I said he wasn’t the best at this point.